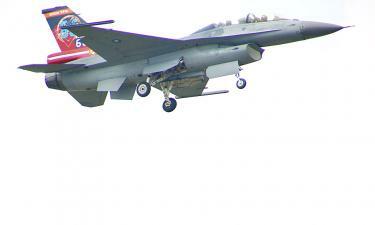 An F-16 jet performs during the Air Force Day airshow at Chiayi Air Base on Aug. 7. Taiwan and the US have agreed to prioritize the development of indigenous depot-level maintenance and repairs for Lockheed Martin F-16s, a defense official said yesterday. The program aims to make the nation self-sufficient in meeting the F-16Vs’ maintenance needs, as opposed to shipping the jets to the US for major repairs, said the official, who declined to be named. Another benefit of the program is to make Taiwan the maintenance center for the F-16 family of jets in the Asia-Pacific region, the official said. The government has so far allocated NT$110 billion (US$3.55 billion) to upgrade the air force’s F-16A/Bs to F-16V standard, for which the US is to give Taiwan an US$800 million industrial cooperation credit, the official said. When F-16 performance upgrade expenditures surpass NT$140 billion, additional industrial cooperation credits would become available, they said. Depot-level maintenance and repair was the 17th item in the original version of the Taiwan-US F-16 performance upgrade industrial cooperation program, the official said. However, after talks with US officials, the government decided to move depot level maintenance and repair capability to the top spot and to accelerate related work, the official said. The government on May 24 began the initial evaluation for building an F-16 sustainment support center, allocating industrial cooperation credits totaling US$50 million for its use, the official said, adding that another US$450 million in credit is reserved for construction planning and preparation. The Ministry of National Defense confirmed that the air force is to use the industrial cooperation credit for the center. The center is to utilize the US military’s aircraft logistical management techniques, which would be transferred from Lockheed Martin Corp to the Chungshan Institute of Science and Technology, the ministry said. The center is expected to be a boon for the nation’s aeronautics sector and provide valuable insight for developing the infrastructure to maintain future indigenous jets, it said. The Democratic Progressive Party (DPP) yesterday accused the Ministry of Economic Affairs (MOEA) of tampering with an impact assessment report on signing an economic cooperation framework agreement (ECFA) with China, saying the ministry had deflated potential job losses that could follow the trade deal's implementation.